UltraShape Power is an FDA-approved pulsed, focused ultrasound device that we use for body contouring & reducing unwanted fat. The device also uses a unique 3D tracking system to guide the procedure and ensure that fat destruction is performed uniformly throughout the targeted treatment area. If you are interested in fat reduction treatments like UltraShape Power, we would recommend a consultation as a first step. The main reason why some people don’t get great results with non-invasive body contouring is because they are not great candidates for this type of procedure in the first place. Having a consultation with a trained, experienced provider is the best way to determine whether or not you would benefit from UltraShape Power. What is UltraShape Power treatment like? We will start your visit by taking a series of photos and measurements in order to track your progress throughout the course of your treatment plan. You will then be taken to your exam room and prepared for treatment. UltraShape Power uses pulsed, focused ultrasound energy, which produces a warming or mild tingling sensation on the skin. Many people even fall asleep during the treatment because it is so relaxing! The length of treatment will depend on the size of the area(s) being treated, but most sessions take anywhere from 30 to 90 minutes. Side effects are minimal for the vast majority of people. You may notice slight swelling and/or redness in the treatment area, but this is normal and will resolve quickly within hours of treatment. Surrounding nerves and tissues are unaffected by the device, which makes the safety profile of UltraShape Power excellent. There is absolutely no downtime associated with this procedure. You will be able to return to normal activities immediately following your treatment. 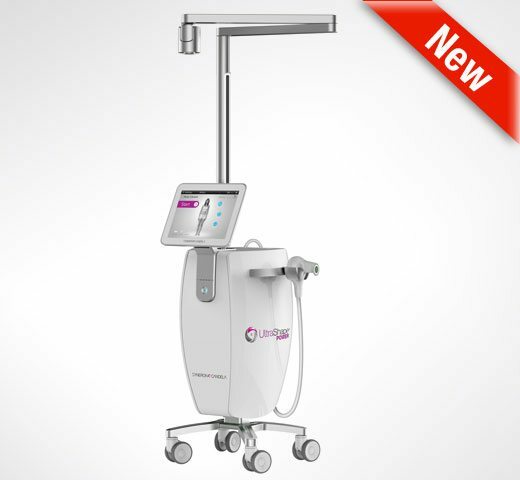 When will I see results with UltraShape Power? How long will they last? The fat cells that are destroyed in each UltraShape Power session will be eliminated by your body, a process that takes approximately 2 to 4 weeks. Therefore, you are likely to start seeing some improvements within 10 to 14 days of your first UltraShape Power treatment. Also, UltraShape Power requires a series of three sessions in order to get the best results, so about one month after your third & final treatment, you will have reached your maximum results. With each subsequent visit the target treatment area will be measured and you will continue to see increased fat reduction.